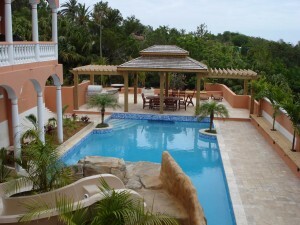 Impress your guests with an outdoor space you can be proud of. Imagine the looks on your guest’s faces as they walk underneath our Custom 14’ x 18’ Treated Pine Rectangular Double Roof Gazebo. They will be floored. Reminiscent of paradise, this Gazebo is featured with larger than usual custom posts, cedar shingles, no floor or railings. Two additional Pergolas are attached to both sides of the Gazebo, tripling space and allowing for more fun and relaxation on the holiday. Serving up a backyard feast is no problem when you have an expansive outdoor room like this. When we attend a party, we are always excited when we see a fun, DIY decoration or entertaining essential. We love this crafty beverage and paper goods station! To create this unique look, you’ll need a large beverage tub, smaller pales, galvanized pipes; connecters; and end caps from a hardware store like Lowe’s or Home Depot, and J-B Weld for gluing. 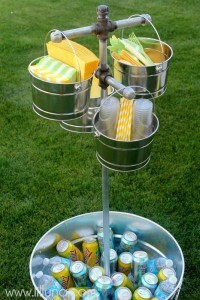 Whether your party will be mostly munchkins or 21+, this drink station is made for adult beverages or soda! And, it’s more than a drinking station – it’s a one-stop shop for napkins, cups, and silverware! The weather is beautiful and you’re surrounded by friends and family on Memorial Day. This special day pays homage to those who have died in service of the U.S. So, make sure you don your red, white, and blue. Your party’s theme could have these colors with accents of stars and stripes. Hang a U.S. flag and display patriotic decorations like our Poly Lumber/Wooden Hybrid Patriotic Lighthouse. The top and base are made from maintenance-free Poly Lumber, which is guaranteed not to crack, chip or rot. And, the lighthouse lights up with a 25-watt light bulb! It would make for a patriotic centerpiece or a focal point at the entrance of your outdoor room. From all of us at Fifthroom.com, we hope you have a safe and wonderful Memorial Day!